Numbness is the feeling of pain leaving the body. Randonneuring is long-distance unsupported endurance cycling. Events are timed but non-competitive. The goofy name stems from the sport's French origins. I first tried it in 2003, and immediately become addicted to the sleepless nights and wonderful companionship. If you enjoy fast touring or long distance travel on a bicycle, you should give this type of cycling a shot. In the USA, the sport's organizing body is, logically enough, Randonneurs USA. Below you can find some ride reports, photos, and other trivia, organized loosely by date and location. In my first year I rode three Boston brevets. My friend Chip Coldwell and I rode the 200K event in a snowstorm, after the organizers had canceled it. We never did write a report of that day, which remains our lifetime distance-divided-by-temperature maximum. But I wrote reports of the 300K and the gastrically challenged 400K. 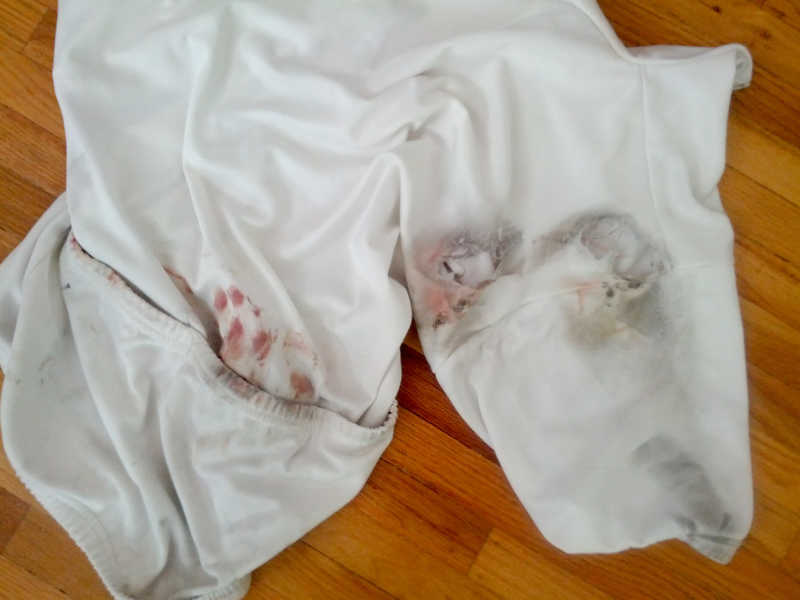 Reports from most of the Boston brevets: the 200K, my solo 300K, and the asthmatic 400K. Chip and I also completed the 600K—and what a hilly 600K it was, out over the Berkshires and back!—but never wrote up those memories of pain. 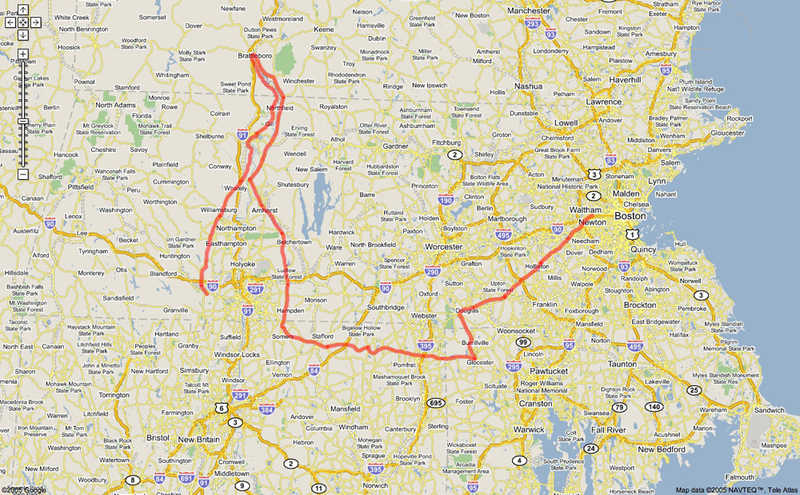 Chip and I cycled out to Westfield, MA to ride some of the Berkshire brevets. My reports of the 200K and 300K. The randonneuring season started early, thanks to John and Pamela "Blayley." You can read the report of the Fleche New England that we rode together with Chip, and take a look at a lame hand-drawn overview map of our route. If you're willing to wait, here are high-resolution PDFs of our route, generated by Chip with his GPS software: stage 1 (3.6MB), stage 2 (3.1MB), stage 3 (3.2MB), stages 4-6 (3.5MB). I liked the shorter Westfield brevets so much that I rode them again. Here are my stories from the 200K and 300K. London-Edinburgh-London is a 1400Km event that only happens every four years, so I flew to England to give it a try. Here is my LEL report. You can take a look at my LEL photo album, though please keep in mind that it's hard to pay attention to photography during a non-stop 1400Km event. Included in the album is my "official" LEL portrait, taken by photograher Dennis Sackett. You can find many other good photos at the official LEL web site. Best of all, Damon Peacock has produced an LEL video clip. If that site gives you trouble, here is a local copy (5.5MB, Windows Media). Sandy Whittlesey, the two-time BMB champion and course record holder, spent eleven years designing the course for D2R2, the Deerfield Dirt-Road Randonnee. Here are my photos and impressions from the inaugural edition. In 2006 I rode more brevets than ever, but, due in part to a busy schedule and a cross-country move from Boston to Davis, CA, I wrote no real ride reports. I rode the full series of Boston and Westfield brevets, plus a 100K populaire and an extra 300K for good measure, and the Boston-Montreal-Boston 1200K. It was a good season for me, and my times on some of the longer events—the Boston 400K, Westfield 600K, and BMB—were personal bests. For the record, I have put together a table of ride results, complete with notes and links to cue sheets for each event. I also wrote a little blurb after the Westfield 100K (notable for its cold weather) and the Westfield 200K (notable for a spectacular wheel failure). Late May and June was a time of tremendously wet weather in New England. My memories of the Westfield 300K are a stormy night-time start, branches littered across the road, cold rain and wind. Three weeks later, the 400K was the wettest ride of my life, 18 hours of unremitting rain and cold that, unlike some other "epic" adventures, doesn't feel good even in retrospect. Better not to have a ride report for that one. If I had to recommend just one New England brevet, it would probably be the Westfield 600K. Don Podolski, the Westfield brevet organizer, has created a beautiful loop itinerary that takes in the best of western New England and upstate New York: rolling farmland, forests, a crossing of the mighty Hudson River at Kingston, a couple major mountain passes, and some wonderful views. This year I rode with Melinda Lyon, Ted Lapinski, Jeff Scornavacca, Bengt Schneider, and Tom Dembinski. It was a memorable adventure, complete with gas-station stalkers in expensive convertibles, the lantern-bearing ghost of Hoosic Tunnel, a beauty queen stumbling on someone else's porch in the middle of the night, and Ted's 8-egg omelette of the apocalypse at the finish. If only I had more time to write about it! It may be cryptic to the rest of you, but for those of us who were there this picture (credit: Ted Lapinski) is worth a thousand words. I rode BMB in 61:22, about ten hours faster than in 2004. My goal was to finish in under 60 hours, but a couple of riding companions had physical trouble, and most of us chose to ride together rather than split up and seek record times. I finished with Bill O'Mara and Burt Prokop, both New England brevet veterans, and Danny Stevens, Jr., from Florida. They were outstanding company. Twelve hundred kilometers of New England hills in Bill's company only increased my already great respect for his climbing abilities. Somehow near the end I still had enough in me to "put some pain into the boys," as he put it. It was probably my strongest ride so far. Just after BMB I drove a truck cross-country from Boston to Davis, California in five days. I don't recommend doing both back-to-back like that. On a trip home to Italy in October, I had the opportunity to ride the Eroica, a "period" 200K ride mostly on gravel roads in the Chianti region of Tuscany. I wore a wool jersey (as always) and rode a late '80s Bridgestone road bike, but felt almost uncomfortably high-tech. Many of the twelve hundred participants rode vintage bikes dating as far back as the 19th century, and few used clipless pedals or lycra shorts. The ride itself is beautiful, less wooded and remote than D2R2 but outstandingly scenic in its own way. I brought a pocket camera along for the day, only to discover that the batteries were dead—one more excuse to do it again. Late in the year I rode two Santa Cruz permanents to explore local scenery and round out my mileage for the year. The first ran mostly along the coast between Santa Cruz and San Francisco, while the second reached inland to the Salinas Valley south-east of Santa Cruz. Both were stunning rides: ocean cliffs, redwood groves, massive grassy hills bright green after winter rains and punctuated by dark, shaggy oaks. California's natural beauty is not subtle. In early March I rode the Davis 200K and the Santa Cruz 200K. The former I rode on a hot, sunny day, mostly in a paceline (except when that paceline broke apart on the long climb up Mt George), and it took me 7:19. The second I rode on a cool, foggy day, mostly alone, and it took me 7:20. Go figure. The common feature of both rides was strong wind. Both were pretty courses (especially the Santa Cruz one, which I was familiar with from a ride last fall) but I didn't know anyone yet and sorely missed my Boston bike peeps. Despite hot weather and empty water bottles, the Davis 300K on March 24th was the first 300K I finished in under 11 hours. The course was probably easier than those in New England, and maybe the opportunity to go on long rides year-round (without losing extremities to frostbite) is paying off. I wrote a ride report. I was pre-registered for the Santa Rosa 300K a week later, but skipped it to help Kara take care of Marilisa. Same deal for the San Francisco 600K on April 21. Fortunately there are 3 more 600K events on the San Francisco-area calendar. One event I did not skip was the Davis 400K. This year's course was wonderful, and the weather, in addition to some mechanical trouble, made it something of an adventure. Here is my ride report. In late May, having missed both the SF and Davis 600Ks, I rode the Santa Rosa 600K. A month later (better late than never) I finally managed to produce a write-up of that ride. Now I am qualified for PBP and try to stay in shape by riding whenever family and work allow it. For extra motivation I also rode the Big Basin 200K, a mountainous route that features over 13,000 feet of climbing. You can read my report of a day out of the saddle. The Santa Cruz Moss Beach 200K was beautiful as always, with sunny skies and a powerful tail-wind heading into the finish. I rode much of the way with David Strong and Ken Holloway, and we finished together with Masa Kobayashi in 7:31. The SF 300K introduced me to Russian River and the spectacular Sonoma coastline. I finished in 12:04 in the excellent company of Russ Fairles and the Beato brothers, Greg and Keith. On August 17, I participated in the RUSA 10th anniversary ride put on by the SF Randonneurs. The 200K route is one of my favorites, and takes in some of the highlights of the SF 300K. I never found a good pace match, and rode mostly alone to finish in 8:12. This year the Davis Bike Club is organizing the Gold Rush Randonnée, a 1200Km event that has been held every four years since 2001. It is a sign of randonneuring's growing popularity that I was roughly three-hundredth on the waiting list despite having signed up in January. In January I rode the hilly SF 200K. The ride to the Point Reyes lighthouse and then up Tomales Bay was spectacular, but I felt pretty weak, stopped for two flat tires, and struggled to finish in 8:13. By the SF 300K, I had several more long rides under my belt and finished strongly with the lead group in 11:20. I wrote a ride report. I missed the Santa Cruz 200K due to family commitments, but squeezed in the Davis 300K. It was a hot day with headwinds on the return leg, but Bryan Brock and I worked together to finish in a relatively brisk 11:02. That's fifteen minutes slower than in 2007, but I felt a lot stronger and not as close to the red line. The SF 400K is a gorgeous ride. Aron Mason and Russ Fairles and I rode together the whole way to finish in 16:29, and I did a write-up. Devil Mountain double century: 200 miles, about 19,000 feet of climbing, almost no shade. I went out too fast, bonked on Patterson Pass, overheated in the hinterlands behind Mount Hamilton, and struggled to the finish in 16:02. I'll be back next year to try to do better, though I sort of dread it already. This is one ride that is all about, uh ... self-improvement. Terrible Two double century: some of the climbs are steeper than at Devil Mountain, but the aggregate climbing is more moderate (16,000 feet), and the scenery is its own reward: vineyards, fields, redwood forests, coastal cliffs. This is probably my favorite one-day ride in California so far, and I understand why some have been doing it every year for a decade or more. I finished in a relatively peppy 13:01, after time trialing for an hour from Monte Rio to Sebastopol in an attempt to make it sub-thirteen. Davis 600K brevet. A lovely ride through the Central Valley and the Gold Country foothills that follows the first and last quarters of the Gold Rush 1200K route. Thunderstorms in the mountains made for a spectacular sunset and a wet but memorable ride up the Feather River Canyon to Taylorsville. A small lead group (Russ Fairles, Gintautas Budvytis, Aron Mason, Wade Baker, John Lauer, and myself) rode together for over a hundred miles, then split apart on the climbs. Russ, Gintautas, and I rode together all the way, but despite our best efforts we never did manage to catch Wade or John. Nonetheless, our time of 25:36 was a personal best for me on the distance. Favorite memories: the Feather River Canyon emerging from darkness under a light drizzle in the morning; bright green rice paddies stretching to the horizon from the levees of the Sacramento River; fries at In-n-Out Burger with Gintautas when it was all over. Big Basin 200K brevet. A repeat of 2007's super-hilly jaunt through the redwoods, with some extra heat thrown it: it was 98F on top of China Grade in Big Basin State Park, and 100F in Cupertino. Barley Forsman and I rode together to finish in 8:36, the day's best time and a bit faster than what I managed in '07. Cold soda at the finish tasted good. Despite my worries about the waiting list, everyone who wanted to got to ride the Gold Rush 1200K. It was an epic adventure, and I wrote a ride report. A lot of riding (on top of work and family) has left little time for writing. But I've had a good randonneuring season, with a surprising string of personal best times in the 300, 400, and 600Km distances. Frankly, I doubt I could have achieved them without the help and companionship of a small group of fast and similarly motivated riders, especially Russ Fairles and Peter Morrissey. And the bike commute from San Francisco to Mountain View can't hurt either. Like in 2006, I jotted down a couple sentences by which to remember each ride—see here. The highlight of my season was definitely the Davis 600K, my fastest and in some ways most difficult long-distance ride to date. I wrote a ride report for that one. For the first time, with David Strong's help, I designed a brevet course. The Old Caz 300K was held on August 28. It was a nice day, sunny but not too warm. I rode to Cazadero with Vidas Placiakis, Brian Koss, and Alberto Blanco, a former pro. Alberto and I would pull away and then wait on the top of climbs. After Cazadero, Brian and Vidas told us not to wait any longer, and Alberto really put the hammer down. It was all I could do to hold his wheel. I finally blew up near Stinson Beach, and he put 10 minutes into me in the last 15 miles to the finish despite suffering a flat! I rolled into the finish in 14:12—a respectable time for such a hard course, I think. I had ambitious plans for 2011: to erase my failure at Paris-Brest-Paris 2007 and possibly qualify for the "Société Charly Miller". My randonneuring season opened on Jan 8 with the workers' ride of the Point Reyes 200K. It was a misty day, with occasional sprinkles and temperatures in the low 40s. Carlos Duque and I rode together to Inverness, where we agreed to split up as I accelerated. My favorite memories are gauzy sunshine breaking through the overcast on the outer cape, and the images of clouds on Nicasio Reservoir's dark and glass-smooth surface. I was back in SF in a leisurely 8:17. A month later (Feb 12), the Two Rock 200K had an entirely different feel: sunshine, blue skies, and a punishing paceline led primarily by Marc Moons. We covered the 19 miles from Petaluma to Valley Ford in 50 minutes (23mph average). On the rollers along Tomales Bay I still had enough brain oxygen to appreciate the wonderful display of yellow mustard flowers. We finished in 7:09, my best time on this moderately hilly course. I missed the SF 300K due to a trip to Europe, but made up for it with the Davis 300K on March 26. What a way to celebrate a birthday: six hours of heavy rain and wind, followed by snow near the top of Cobb Mountain! Fortunately the return was easier, but back at the finish, after 11h45m, I felt unusually old and battered. The second transatlantic trip in a month prevented me from showing up to the SF 400K in top form. After about 100Km I dropped away from the leaders' paceline (Russ, Aron, Brian, and so forth) to ride alone at a more sustainable pace. I was frustrated with myself and briefly considered abandoning, but I held on and gradually regained my enthusiasm as the miles rolled by. It was a beautiful spring day, with the usual gorgeous spread of wildflowers along Mountain House Road. In Hopland I caught up with Gintautas Budvytis and Geoff Hastings, and together we made respectable time back to San Francisco, finishing in 16:53. The following morning I woke to the news that Jim Swarzman, a randonneur whom I'd met during Old Caz in 2010, had been killed overnight by a pick-up truck during the San Diego 600K. Just the day before I had been only meters behind Gintautas when he himself was almost taken out by a passing car. It was a terrible end to the weekend, and for the first time I really questioned our sport. I didn't know it (nor did I care) right away, but my PBP 2011 ambitions ended on May 2, with the death from leukemia of a loved one in Italy. I struggled with depression for weeks and was unable to complete any substantial ride, let alone the required 600K qualifier. It took a while, but I finally emerged from my dark tunnel in time for the second edition of Old Cazadero. As the route designer, I pre-rode the course one week before the main event, on July 23. I was in worse shape than in 2010, but I had smarter gearing (a 34x27 low gear!) and I paced myself more intelligently. It was a gorgeous, sunny day, and despite 45 miles of strong headwinds from Bodega to Stinson Beach, I finished in 13:48. That was my first sub-14 finish on the course, and 24 minutes faster than in 2010. Cycling is good therapy. Point Reyes 200K: I rode the worker's ride on January 14. It was a splendid day, cold but sunny and with nary a whisper of wind. I rode to Inverness with Heath Allen and then pushed on faster by myself, finishing in 7:55. Two Rock 200K: a mild but partly cloudy day. I didn't feel great and lost contact with the lead group shortly after Fairfax. I rode alone most of the rest of the way to finish in 7:40. Sometimes it's good to ride alone and focus. Russian River 300K: a splendid and varied day. Sonoma valley was ablaze with sunshine and cherry blossoms, while much of the coast lay shrowded in fog and battered by ocean winds. By Healdsburg, a large lead group had thinned to just Russ, Aron, Will Schultz, Jack Holmgren and myself. Sadly, Aron had to abandon not much later due to a broken seatpost. At the mouth of the Russian River, Jack decided to ease up, leaving Will and me alone to try to rein in Russ, who was having an incredible day. Despite a run-in with a police officer for rolling through a stop sign, we arrived at the finish in a very peppy 11:30. And then, in mid March, at 3rd and Channel in San Francisco, I crashed. I took the sidewalk to avoid heavy traffic and hit a sharp ledge in the pavement. My tire blew out, the rim deformed, and I went down onto my left hip. "Fracture of the iliac bone", said the doctor. No 400K, no 600K, and no Cascade 1200: just physical therapy. Such is life! I recovered quickly enough to do a final pre-ride of the Marin Mountains 200K in June, and gradually regained strength by completing the adventure series: King Ridge 400 (22:35) in July, Old Cazadero 300 (14:11) in August, and Marin Mountains 200 (12:36) in September. The inaugural King Ridge event, coming on the heels of a worker's ride in which I broke the old Rambouillet's frame for the second and last time, was an epic adventure, with blistering heat on the coastal ridges in the early afternoon and frigid fog at night in Marin dairy country. Photos here. September saw the Santa Cruz 600K, which I finished in a respectable 26:26, riding solo from start to finish. It was a beautiful ride in many ways, but also illustrated for me some worrisome aspects of large-scale agriculture. Ride report. The randonneuring season ended with two great events: in October, Brian and Vidas and I scouted the Ventana Wilderness as a possible option for an adventure series 600K. No RUSA miles, but lots of beautiful sights and smells: photos. In November, I rode my first SFR Del Puerto Canyon 200K, finishing in 7:21 in the company of French Clements. 2013, eight years since my first LEL: I tried to sign up, but the event sold out within twelve hours. Lacking a clear goal, I rode less than usual and spent a lot of time skiing. The highlight, without a doubt, was an epic ski tour of the Minarets, in the eastern Sierra. My only spring brevets were the SFR Valley Ford 200K (in a personal slowest time of 7:54) and the Davis 400K, which I finished in a pretty quick 15:02, in the company, among others, of Russ Fairles and Andreas Schulz. I decided to ride the SFR Fort Bragg 600K worker's ride alone, but hit a sharp rock near Lagunitas and went down hard, scraping my helmet, shredding the skin off my shoulder blades, and even lacerating my fingertips (of all things!). The jersey was ugly. I managed to limp home under my own power, injured even more in my self-confidence (two accidents in two years was unprecedented) than in my body. A few weeks later, Deb Ford contacted me to offer me her entry into LEL. I could not say no, and jumped into a belated but intense training regimen. That included a solo Old Caz 300K in the rain, the same ride a week later with Vidas in unbearable heat (it took us over 17 hours), and an epic 600Km scouting ride all the way to Mendocino County and back with Vidas and Brian. The scouting ride lay the groundwork for the new SFR Orr Springs 600K. Another highlight, albeit less physically intense, was a pair of long tandem rides with Marilisa. The second was the SFR 120Km “dart populaire” team event, Marilisa's first randonneur event (at age 7)! We rode together with a single, two other tandems, and a triple, for a total of 4 kids and 6 adults. Super fun. Photos of this and of the Orr Springs scouting ride this way. And then there was LEL! The ride logistics were difficult, scrunched as it was into a five-week multi-country family trip to Europe. And the weather was much worse than it had been in 2005: in Scotland, in particular, we experienced some of the most intense thundershowers I've ever ridden through. But, just like in 2005, I came away hugely grateful to have taken part in this event, with its awesome volunteers, quirky cast of international cyclists, and splendid landscapes. Vidas and I rode together the whole way, and for the last 600Km or so we were joined by Cezary from Poland (for the first time, my maternal Polish came in useful in a cycling context). The three of us finished in 89:46, around midnight on the fourth day. Memorably, we played tortoise and hare (we were the hare) with Ken Bonner for hundreds of kilometers, but that awesome old man's relentlessness paid off, and he actually beat us to the finish. I took many photos. The wettest ever Marin Mountains 200K, a mudfest without peer. I finished in a painful 12:20, and wrote a ride report to memorialize the experience. The Del Puerto 200K, completed in a brisk 7:08, in the company of Mike Gao and local U23 racer Travis Lyons. An awesome Davis Dart event in the company of Metin Uz and Michael Bloomfield (photos). The course evolved into the Davis Trinity permanent. A mid-december run of the Old Caz 300, in the company of Mike Gao, Patrick Herlihy, and Megan Arnold. Conditions were clear, dry, and frigid: it's not every day that you get to ride on ice in California within a few hundred yards of the Pacific. Photos. The year got off to a good start with a beautiful early-January run of the Marin Mountains 200K, followed the next day by a fun kids-and-tandems ride in the East Bay. Valley Ford 200K in 6:59 on February 22, in the company of the amazing Paul & Paul tandem. Davis 300K in 10:23 on March 22 (a nice early birthday celebration), with Andreas Schulz (ride report). Davis 400K in 13:36 on May 3. I rode the entire way in a great paceline with Andreas, Patrick Herlihy, and Jose Plascencia. I believe that this is the record for this 400K course. SFR 600K in 26:22, solo the whole way and into an unbelievable headwind. Davis 600K in 23:07 on June 13-14 with Patrick, Andreas, and the Paul & Sarah tandem. Old Caz 300K in 12:50 on August 23 (also a course record, though not very meaningful because Old Caz has limited ridership). I rode with Brian Koss until Cazadero, then solo the last 90 or so miles to the finish. Del Puerto 200K in 7:06, again in the company of Mike and Travis (but this time with Carl Andersen, too). Some of these were only two or three minutes faster than past personal bests, but still, I was pretty happy with the consistency throughout the year. Maybe forty really is the new thirty! An awesome scouting ride with Patrick to help design a new dirt 200K (a few photos). A Freestone Bread Run 220K permanent with Eric Larsen in February during a downpour so intense that our bikes may as well have been boats. A windy and mostly-solo SFR Healdsburg 300K worker's ride in March (ride report). An epic, wet, sub-16-hour SFR Hopland 400K with Aron Mason in April (ride report). Another kids-and-tandems adventure for the SFR dart event in May. We were team Tandemonium. The worker's ride of the SFR Orr Springs 600, with Vidas (photos). That is a hard ride! A late October run of Old Caz with Mike Gao and Roy Ross: squalls and wind, but gorgeous light (photos to come). A repeat of the Davis Trinity Dart from 2013, this time with Metin, Mike Gao, and Roy Ross (photos). And the randonneur highlight of the year, of course, was the California Central Coast (3CR) 1000K in August. I regret that I did not write a ride report for this ride, but photos are here. I could not have asked for better scenery or company on this ride. Coming off a tour of the Alps in July, I timed my preparation perfectly, and rode the 1000K better than any previous event of comparable length. I rode with a large group of friends (Russ, Vidas, Gintautas, Patrick, and others) on the first day, then Carl Andersen and I got down to business and really hammered (that is when the photos more or less stop). We finished the 1000K in 46:22 (the event's best time), but Carl wasn't done: he had signed up for the 1200K event, so (impressively) he got back on his bike for 200 more kilometers, eventually finishing in approximately 57 hours (also the fastest 1200K time). Future ride reports will all appear directly on veloblog.maxp.net.